"Moomau"...an interesting name for a business. Sounds like some cute word for someone's grandmother. Or you could say it three times fast and sound like a 1950s doo-wop backup singer. Someone sent this to me several years ago, but I've since lost this person's contact information. 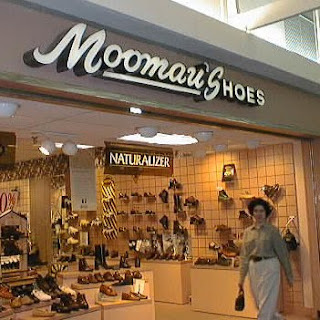 There's a Moomau's Shoes in Norman, Oklahoma. I wonder if its the same store.